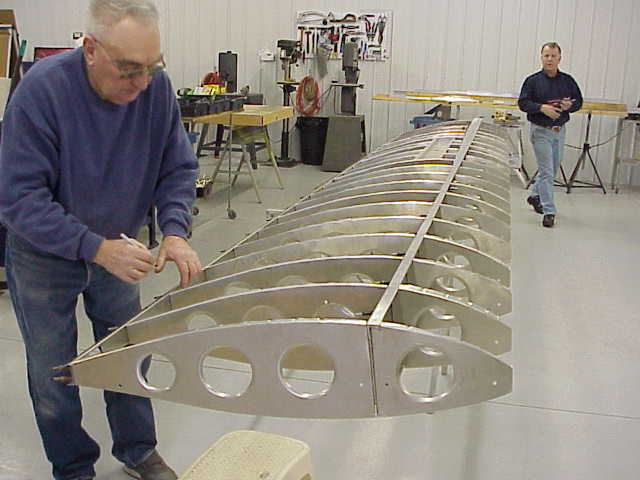 This is a project to demonstrate and test a new method for constructing small aluminum airplanes - a method convenient to homebuilders and small manufacturers. The method should make significant laminar flow achievable in aluminum skin wings, lighten & strengthen the constructed plane, and much more. A 20% decrease in wing drag (other than induced which drops as speed increases) over a useful range of speeds and angles of attack makes for perhaps 5-10% overall drag, so a considerable fuel savings and/or a virtual increase in the engine's thrust for greater performance. Laminar flow is the Holy Grail of aerodynamics - later on see why it could now be achieved by amateurs in aluminum. A principle achievement and practical goal of the method's consequences is a radical reduction in fuel costs. But a light, air- and water-tight, strong, vibration free plane presents many opportunities. The requirement is to build a forward-looking aviation project - with significant innovation. The innovation (the construction method and its implications) is meant to energize interest in General Aviation, pilots, ex-pilots, would-be pilots, families, enthusiasts and journalists. "Continuous" fastenings (e.g. aviation fasteners VHB tape, epoxies, and Welding Films) are the key to the fastening method. They could enable (homebuilders included) to achieve extensive laminar flow in aluminum wing skin construction (and in some "internal" structures replace rivets and bolts with continuous weld). Unlike similar materials put in use some time ago in airliner construction, these "adhesives" cure at temperatures (150F,250F) and clamping pressures easily and simply achieved by home builders and do not present the handling and toxicity issues of some welding methods and of liquid epoxies and other glues. Eliminating virtually all surface riveting (and that of much internal structure) also permits the use of stronger (i. e. effectively lighter) alloys (e.g. 7075 & 2024) than rivet friendly 6061, and could save on the order of 500 hours of construction time. The project also takes advantage of an accident of General Aviation's commercial history: the most common current engines are reliable but quite heavy and inefficient. Reliable aviation engines are now available with -per horsepower- vastly lowered weight (by a factor of 2 to 3) and fuel consumption (by a factor of 3 to 4). Their fuel is auto pump gas at less than 1/2 the cost of AvGas. Concretely, in one line: the project would build two identical aluminum wing sections with (potentially) laminar airfoil 64-415 (each with span of about 3-4 ribs), one span with conventional means, one with innovative "continuous fastener" means, then test and compare for strength and other flight relevant properties, including at least rough measurement of extent of laminar flow. RC Modeler Wanted Who might like to build an RC model of our "target" airplane, much modified from "stock" (might be RV10-like, 172-like, Sonerai-like or Xenos-like.) There's one or two RV Arf's available (4, 8 or 9 I think), infinite 172's, a Sonerai plans built (which could also be modified to be Xenos-like.)? It would be test flown, and would match more or less the X-Plane model on the simulator.